Sitting at a table under a canopy of rustling Chinese windmill palms, sun flickering in the fronds, feet in the sand, it’s easy to forget that you’re not on some tropical island. It’s difficult to imagine that people are skiing down Oregon’s glacier-frosted Mt. Hood just 90 miles away, or lining up at food trucks in Portland less than a half-hour up the road. At Jim and Evi Parsons’ two-acre homestead in Woodburn, Oregon, it feels more like you’re in Margaritaville, every day of the year. Jim Parsons got a taste for tropical climes on teaching gigs in Guam and Honduras. Settling down in Oregon in his first house in the late ‘90s, he mail-ordered some seeds for Chinese windmill palms to surround himself with an ongoing summer vibe. He got good at spotting palms in the area. Even without tropical sun and trade winds, they were thriving. Parsons quickly became a palm proponent. Parsons began studying palms that would grow in the temperate Northwest. He combed the internet and visited nurseries and questioned pioneering breeders like the proprietors of Cistus Nursery in Portland. He collected seeds from local hardy palm trees and grew them in pots, selling the plants at a local farmers’ market. In 2003, it was a tough sell. Temperate palms. “People have this impression that palms don’t grow here, when in fact there are thousands of palms, including about 10 that will grow in temperate climates,” Parsons says. Depending on the species, a well-established palm with 3 to 4 feet of trunk can endure temperatures as low as 5 or 10 degrees Fahrenheit without even being wrapped, Parsons notes. Hanging ice can make the leaves droop, but the plants bounce back. 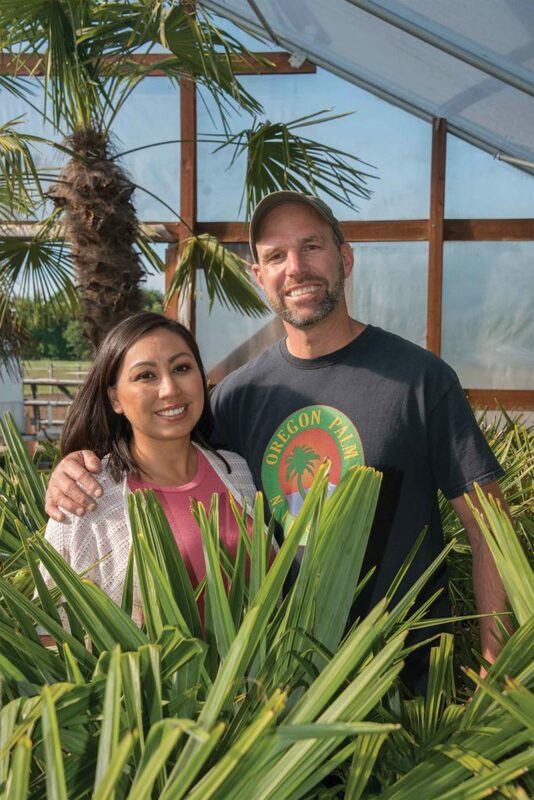 Evi and Jim Parsons created Oregon Palm Nursery to promote palms that thrive in northern climes. “A lot of times when you start to get into palms, you think, ‘I’ve got to baby it. I’m going to wrap it. I’m going to knock the snow off it.’ You’re still in the mind set that it’s tropical,” Parsons points out. they thrive in the long days of the northern summer. The first step in enjoying the endless summer of homestead palms is choosing species that work in your locale. Chinese windmill palms start growing as early as March in the Parsons’ area, allowing them to put on as much as foot of trunk per year. Blue Mediterraneans break dormancy much later, so they grow slower. Waggie palms from Japan and Chilean wine palms are very slow growers, but Parsons says they’re gaining popularity among gardeners and landscapers looking for something new to complement the windmill palms they already enjoy. Because palms are so tolerant of transplanting, homesteaders can choose from a wide range of sizes, from foot-tall, 1-gallon starters to mature 12-footers that can create the look of an instant oasis. Get established. The key to success with palms is getting them established well, Parsons says. a better chance to make it through the winter if you get a root established through the summer. Dig a hole twice as wide as the root ball and don’t plant too deep, Parsons advises. Mix in a well-draining soil mix, sand, pumice, or bark chips if your soil is too heavy for good natural drainage. Where drainage is an ongoing challenge, Parsons suggests planting into a berm 2 to 3 feet high. If the local soil is nutrient-deficient, blend in compost, fish meal, chicken or steer manure, or kelp. Otherwise, Parsons recommends an occasional topdress of micronutrients, or Lutz Palm Spikes. “They’re really low-maintenance,” Parsons says. “The only thing you have to do once they’re established is trim them if you want the neat look. As the Parsons learned about palms, they also started exploring exotic companion plants that complement them in the landscape. Japanese maples add color, as do the rich purple-and-green leaves of red Abyssinian bananas and the plum-colored, sword-like blades of Cordyline purpurea. 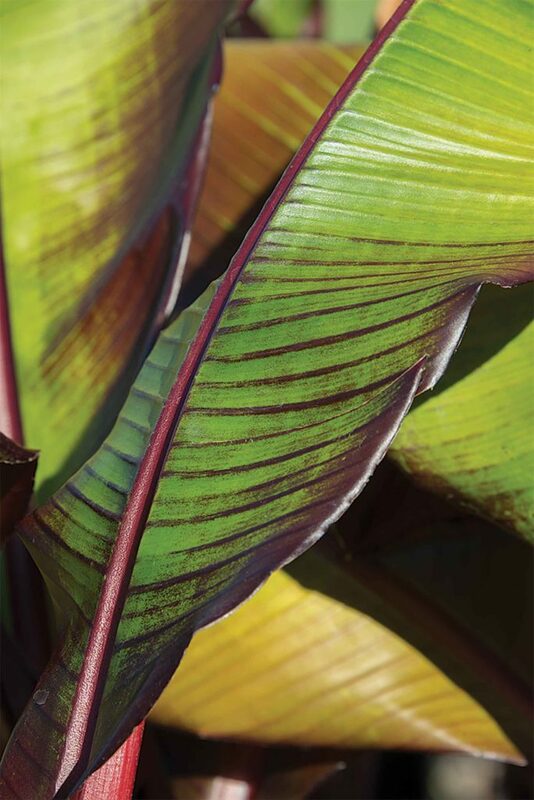 Red Abyssinian banana—which, unlike true palms, grows from a rhizome instead of a seed—is one of many great companion plants for palm trees, adding rich color and tropical feel to a landscape. Bamboos and grasses go well with palms, Parsons adds, as do a wide range of yuccas and agaves whose spiky leaves and desert look add to the feeling of heat and exoticism of a stand of palms. Many yuccas and agaves are surprisingly hardy, making them a great partner for cold-tolerant palms, he notes. Parsons adds that planting close to a house can add a zone or two to your plot’s hardiness. Working homestead. Jim and Evi Parsons take advantage of the microclimates around their house, which is a showcase for the versatility of palms and their companion plants. They also take advantage of every inch of their 2-acre homestead, which was bought with the intent of creating a working property. They harvested the Christmas trees cultivated by the previous owner and dove into the palm business, establishing Oregon Palm Nursery. Cacti and other succulents make great companions for palms. So does bamboo. 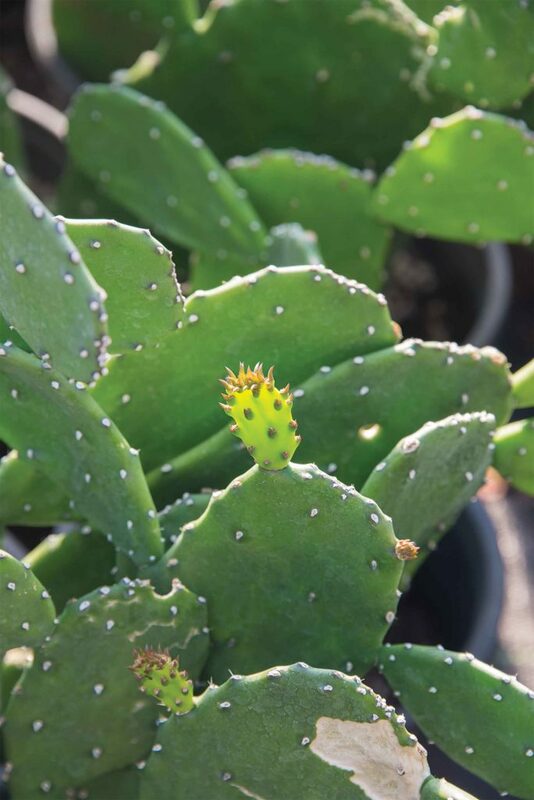 Four big plant sales in the Portland area have long been the foundation of the nursery’s business. Parsons went online by selling locally through Craig’s List. In recent years, oregonpalms.com has generated nationwide orders, and Parsons now also offers some inventory through Amazon.com. Both Jim and Evi work for the local school district, which gives them summers off to cultivate the palms that line their land and fill their greenhouse. That’s just the way Jim likes it. Evi Parsons adds that she loves raising the seedlings that crowd the beds behind the shed. After a busy day with the nursery, there’s no better place to kick back and relax than under their circle of Chinese windmill palms, decked out with a load of beach sand and all-season outdoor furniture. And though he and Evi have created a diverse palm paradise in their backyard, Jim Parsons has a retirement plan that would—not surprisingly—put him and his family beneath even more palm trees. “Seeing these palms growing in their native habitats is on my bucket list,” he says. Playing in natural outdoor settings still capture Northerners’ imagination.